Adding auto tuning function of PID and restoration speed adjustment function to the conventional model has enabled full demonstration of the performance of soldering iron. Even a person using LA soldering iron for the first time can master it immediately. The necessity of two reamed controllers. It is getting difficult to cope with the severe restriction condition of lead-free soldering by one type of soldering iron. Electronic parts and boards continue to diversify and thermal capacity of soldering objects differ greatly. In such situation, please try two ream type controllers, which will not take much workspace. Setting temperature and actual temperature of iron tip are constantly displayed digitally. Auto tuning of PID value enables the restoration to the most adequate temperature. Equipped with regulating function of restoration speed. 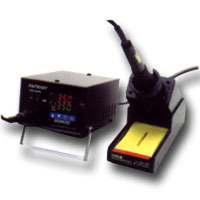 Corresponds to all TB series soldering irons. Temperature change is displayed on liquid crystal screen. For specific work as it has no digital display. Occupation area is same as the single ream type. Soldering iron to be installed can be freely selected. It is best for works in which many kinds of soldering irons are used, such as cell work, correction and repair work.